There’s a reason why we know who the principal players were on the stage of the court of King Henry VIII of England. And there’s a reason why we know what they looked like. 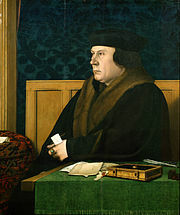 He is Hans Holbein the Younger, the principal portraitist of early Tudor England. But he wasn’t just a portraitist. He was an artist extraordinaire. Hans Holbein was born in the free imperial city of Augsburg sometime in the winter of 1497-98. His father was known as the Elder and was an accomplished artist himself of the Late Gothic period. Hans and his older brother Ambrosius studied under their father in the trade of art. In 1515, Hans and Ambrosious were apprenticed to Hans Herbster, the leading painter of Basel, Switzerland. In the beginning they worked in woodcuts and metal cuts for printers. Hans moved to Lucerne and painted murals and religious works and designed stained glass windows. It is believed Hans traveled to Italy in the winter of 1517 to study the Italian masters. In 1519, he moved back to Basel where he rapidly established himself with his own workshop. He joined the painter’s guild, became a citizen of Basel and married Elsbeth Schmid, a widow with an infant son. Together they had a son named Philipp in their first year of marriage. Hans was very prolific in many mediums during this time period. He was asked by a local theologian to pen drawings for the margin of a copy of the book “In Praise of Folly”, a work by the humanist Desiderius Erasmus of Rotterdam. He started working in portraits and reached international fame with his portrait of Erasmus in 1523. In 1524, Hans traveled to the court of King Francis I of France seeking work. In 1526, he decided to travel to England for work and came highly recommended by Erasmus to his friend Sir Thomas More. More warmly welcomed Hans and found him commissions. More described Hans as “a wonderful artist”. Some of Hans’ famous portraits from this time are of Sir Thomas More alone and again with his family, William Warham, Archbishop of Canterbury, and the Bavarian astronomer Nicholas Kratzer who was also a tutor of the More family. In 1528, Hans returned to Basel and bought a house. He painted some frescoes and portraits but his commissions began to dwindle and he returned to England in 1532. Because the political climate had changed, due to Henry VIII’s break with the Catholic Church to marry Anne Boleyn, Sir Thomas More had fallen out of favor. Hans distanced himself from More and became highly favored by the powerful Boleyn family and Thomas Cromwell, the King’s principal secretary. Cromwell had seized control of all government, including artistic propaganda. 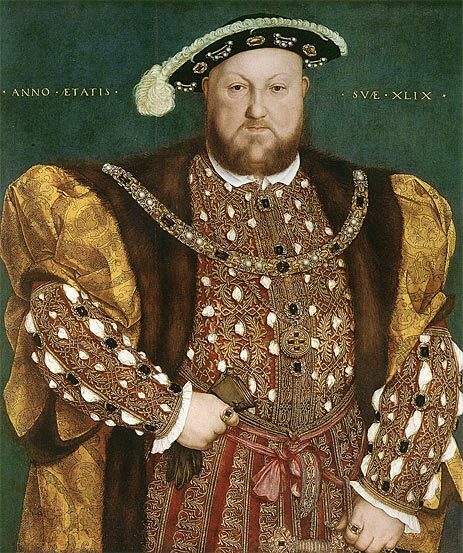 His portraits at this time included merchants of the Hanseatic League (a precursor to the European Union), ambassadors, Anne Boleyn (none of which survive), Cromwell, Henry VIII, Jane Seymour and her son, the future Edward VI and other courtiers. By 1536, Hans was employed as the King’s Painter with an annual salary. After this, Hans’ style of painting changed and he focused more on the sitter’s faces and clothing rather than props and background. His style interprets the sitter in a realistic and individual style with the clothing in exquisite detail. 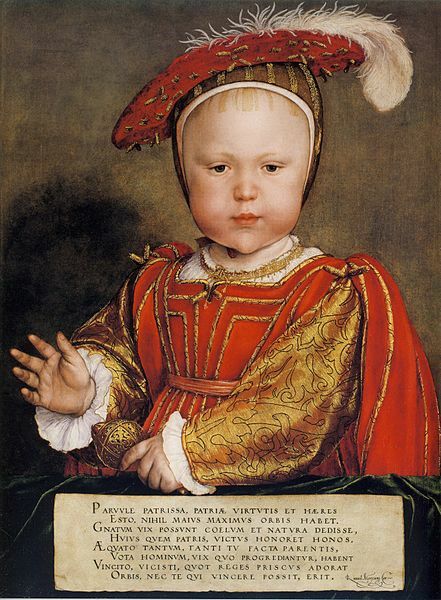 His paintings are a unique source for Tudor attire. 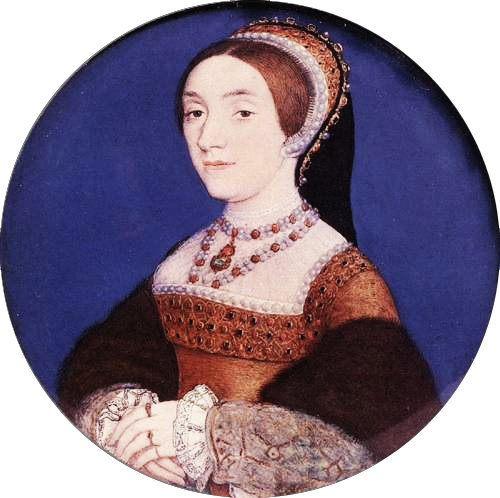 He applied his new technique to miniatures like a portrait of Jane Small and in two of his most famous commissions, completed for King Henry. 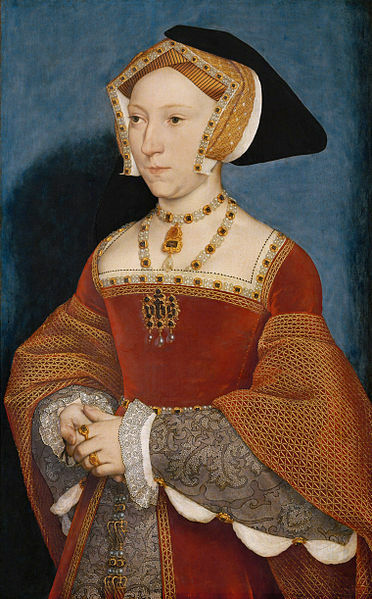 After Jane Seymour died, Henry went in search of a new wife. 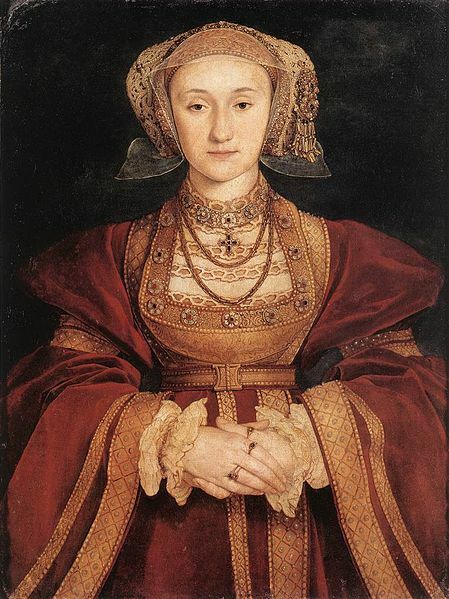 He sent Hans to travel to Milan and the Duchy of Cleves where he painted portraits of two possible brides, Christina, Duchess of Milan and Princess Anne of Cleves. 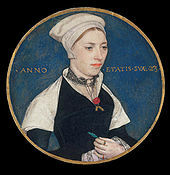 Henry chose Anne to be his fourth wife based on Hans’ portrait. Needless to say, Henry found Anne in the flesh to be quite different from the Anne in the portrait. After the fall of Anne Boleyn and Thomas Cromwell, patrons were hard to find. Hans eventually procured a patron in Sir Anthony Denny who took control of Henry’s government after Cromwell’s fall. Hans may have visited his wife and children in Basel in 1540. There has been much speculation about his marriage because he spent so much time away from his family. But there is no question he took care of them. When Elsbeth died in 1549, she was wealthy and owned some of Hans’ fine clothes. His legacy includes many types of painting and design. He completed murals, frescoes, designs for stained glass and large and small scaled decorative objects, religious works, woodcuts, metal cuts, drawings, portraits, and paintings. He was truly multi-talented. Holbein was to die sometime between October 7 and November 29, 1543 possibly from an infection or the plague at his home in Aldgate. He had hastily drawn up a will on October 7th. The site of his grave is unknown and probably was never marked. He did manage to be in the middle of all the political upheaval of the era without becoming a victim. He obviously knew how to play the political game in order to survive and prosper. You are right! Somehow he managed to survive it all only to die at a young age. I’m so glad you liked it Nora! Thanks for reading. I have my book on Kaufman now so maybe a post is in future!